This is a very happy news for all the Jio sim users across the nation. This offer is valid for new as well as existing users of Jio. In a conference on 1st December 2016 Reliance Industries Chairman Mukesh Ambani said that the free services under Reliance Jio Welcome Offer have been extended till March 31 as part of its Jio Happy New Year Offer. This is what Ambani said after thanking all of the Indians who helped Jio to build a platform in this nation as one of the largest network in nation. I am grateful for all your feedback over the past 3 months. We take your inputs very seriously. Jio is, and will remain, a customer obsessed organisation. During our last interaction, I promised that we will not sit back until we have provided the best customer and service to all Jio customers. Because of inadequate availability of points of interconnect from other operators, I believe that we are yet to deliver on this promise. But, with the imminent availability of sufficient points of interconnect from other operators, over the coming weeks, I am confident that Jio customers will be able to experience a flawless voice experience. With this humble reflection, I want to announce today… That starting 4th of December, 2016, Every new Jio user will get… Jio’s Data, Voice, Video and the full bouquet of Jio applications and content, absolutely FREE, till 31st March 2017. We are calling this the “Jio Happy New Year Offer”. During this offer period, Jio and Jio customers, will be able to continue our journey of co-creating and building the best network experience together. All our 52 million plus Jio Welcome Offer users will continue to enjoy the unlimited benefits of Jio Welcome Offer till 31st December, 2016. 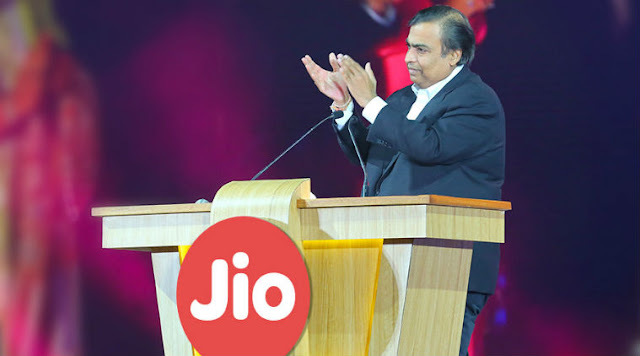 "We are the fastest growing technology company, not only in India, but in the history of the world," said Mukesh Ambani, adding, "in the three months, it's grown faster than Facebook, or WhatsApp, and the fastest growing LTE network."